North West is one of the most fashion-forward toddlers we’ve ever seen, and earlier this week in NYC, she showed off her style yet again. The tiny tot walked hand in hand with Kim Kardashian West for a movie date and looked just as stylish as her fashion-forward mom. North wore a ’90s-inspired slip dress covered in leopard print over a pair of bike shorts, a current favorite of Kim’s, and we’re lusting after the cool-girl outfit. As if the 3-year-old didn’t look trendy enough, she coordinated her adorable ensemble with a black choker and Yeezy Boost 350 sneakers, natch. North may not be old enough to be in kindergarten, but this chic little lady is proving that she already has quite the fashion acumen—and we’re taking notes. Check out North’s outfit we’re crushing on below, and keep scrolling to shop a dress inspired by hers. On North West: Yeezy Boosts 350 sneakers. On Kim Kardashian West: Atsuko Kudo mini skirt; Manolo Blahnik Leva sandals. 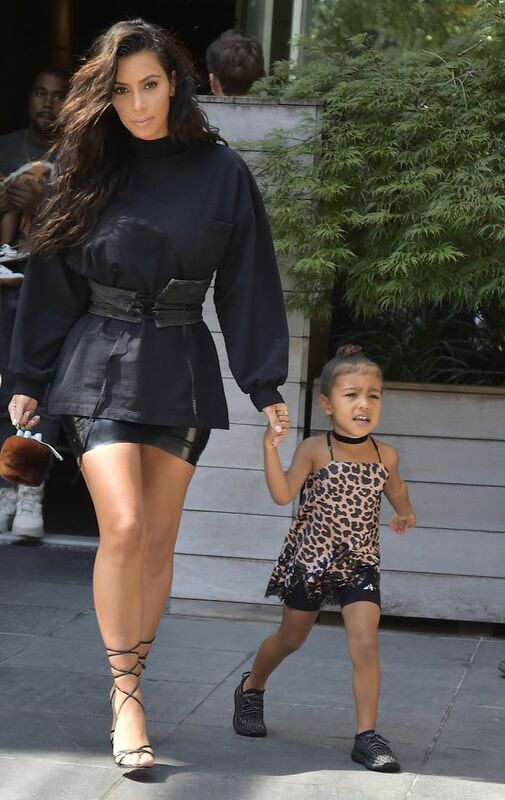 What do you think of North West’s fun outfit? Tell us in the comments?